city with boots, originally uploaded by bbmarie. 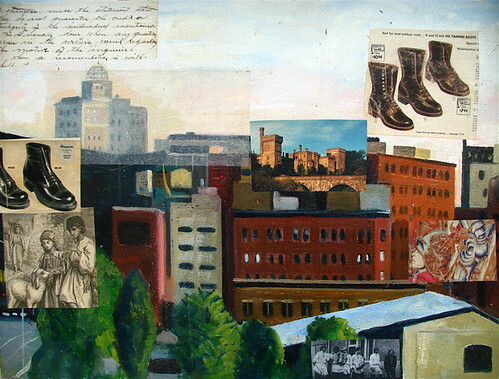 This painting was done off of the Wealthy Street over pass downtown Grand Rapids. I have added collage elements into the painting as a way to break it up and look at a city scape painting in a different way. I like creating images that I don't understand because it helps me to loosen up some of the controls I tend to keep on my life out of fear. I think much of the time God is truly leading us we are finding ourselves way over our head in situations we don't understand. What makes sense about Moses at the edge of the Red sea with a stick in his hand? When you are making a painting you are launching off into the unknown and at the same time you are on the path to deeper understanding. When you are truly looking at a painting, or better yet, living with a painting, you are also on the path to living a deeper life.